ECB decision to hold rates unchanged at today's meeting was hardly of any surprise. This means there is little news in terms of actual policy actions coming from today's council. Instead, some surprises were delivered by Mario Draghi in his statement. Here is a summary. We also got revised outlook for inflation and a warning from Draghi that inflation can be low or that we might yet see deflation. ECB now projects HICP inflation at 0.1% in 2015 (previous forecast was 0.3%), 1.1% in 2016 (previous forecast at 1.5%) and 1.7% in 2017 (previous forecast was 1.8%). Which means that the ECB is still sticking to the miracle of "close to 2% inflation a year after next" target. Of course, both sets of revisions mean that declines in forecast growth in nominal incomes are going to be sharper than in real GDP. Which means euro area will get less income, more prices. That, presumably, remains the 'good side of inflation' in ECB's mind. 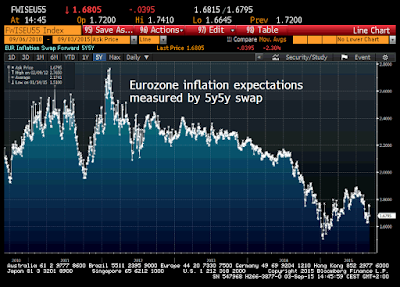 Draghi warned that the 'there are downside risks to September inflation projections'. Now, who could have guessed as much, given that I posted recently the 5yr/5yr swaps chart clearly showing that euro area inflation expectations in the markets have gone soft once again. Shall we repeat that again? Draghi's job today, however, was to talk down the euro. Which he did by simply stating that QE will be running at planned rate (EUR60bn purchases) through planned timeline (to September 2016) and can be extended and expanded if the need arises. Promptly, Euro dropped like a rock. 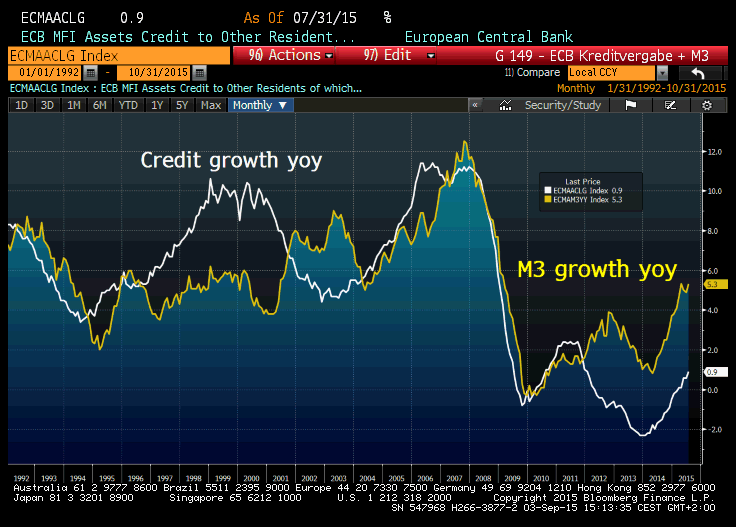 Of course, there is little point of reminding all that growth in credit requires growth in demand. Unless, that is, you are a European policymaker who thinks (as they all seem to be required to do) that issuing loans to companies is a great idea to generate economic growth even if there is absolutely no need for new capacity creation in the economy with stalled demand. 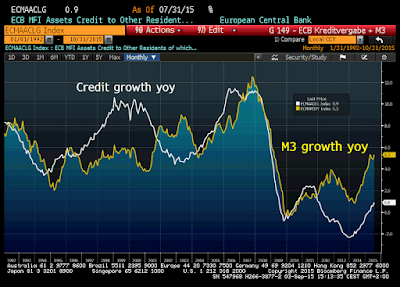 In short, ECB has now reacted to the rot in the Emerging Markets (and in particular China). This is a reactive move with some serious wisdom behind it - the rot is not over yet, by all means and the ECB is out of the gates with signalling that it will continue priming the Government bonds markets pump to prevent any spiking in the rates or euro revaluations derailing already weak exports. With BRIC PMIs signalling ongoing and deepening deterioration in global growth conditions (link here), this is expected and wise. For now, doing nothing new, but promising to do it longer and more aggressively is the preferred response from Frankfurt. It might just be enough.